Explore the best Argentina and Brazil have to offer during this action-packed South America vacation package. Start with the sounds of samba in Rio de Janeiro, Brazil, where you’ll visit one of the New 7 Wonders of the World, the gigantic statue of Christ the Redeemer. Then, you’ll visit South America’s most impressive natural wonder, the spectacular Iguazú Falls, a massive waterfall system that straddles the Brazil-Argentina-Paraguay border. Continue on to cosmopolitan Buenos Aires where you’ll melt to bittersweet tango melodies and enjoy a tour of this bustling and modern city. Upon arrival in Rio de Janeiro, Brazil, you will be met at the airport by one of our representatives and taken to your confirmed Rio de Janeiro hotel. You will have the remainder of the day to rest at your hotel or start exploring this vibrant city on your own. Check out our Rio de Janeiro Travel Guide for ideas on what to do and where to eat in Rio. Start off your Brazil adventure with a private half-day tour up Corcovado, the mountain in the middle of Rio de Janeiro that is famous for its massive Christ the Redeemer statue. You’ll ride through Laranjeiras, one of the city’s oldest residential districts, and into the traditional Cosme Velho neighborhood. Here, you will board a mountain train for a scenic trip through the Tijuca forest, the largest urban forest in the world. Upon reaching the top, 2,300 feet above sea level, you’ll be greeted by spectacular 360-degree city views. Soak up the scenery and feel dwarfed by the 130-foot tall religious statue, one of the New Seven Wonders of the World. You’ll then return to your Rio de Janeiro hotel to enjoy the rest of the day at your leisure. Transfer from your hotel to the airport and flight from Rio de Janeiro to Puerto Iguazú. You will be picked up at the Puerto Iguazú airport by one of our Argentina For Less travel representatives and taken to your confirmed Puerto Iguazú hotel. Enjoy the rest of the day at your leisure relaxing at your hotel or exploring Puerto Iguazú on your own. Read our Puerto Iguazú Travel Guide for detailed destination information. Discover Argentina’s most spectacular natural phenomenon on a thrilling full-day Iguazú Falls tour. You will drive to the Iguazu Falls National Park, where you will enjoy intimate views of the Iguazú River and the falls. The Iguazu Falls tour includes hikes along the Upper Circuit, taking you to elevated walkways leading to the edge of the major waterfalls comprising the system, and the Lower Circuit, a circular route allowing for incredible views from below of the waters crashing down. You will also enjoy a ride aboard the Ecological Jungle Train to the Devil’s Throat, one of the most impressive falls of the park, which you will be able to admire from spacious balconies along the edge of the falls. Although the Devil’s Throat Tour and Upper Circuit are mostly flat, the Lower Circuit involves a lot of stairs, so be prepared for some effort! In the afternoon, you will be taken back to your Puerto Iguazú hotel where you will have the remainder of the day to relax and enjoy Puerto Iguazú at your leisure. Transfer from your hotel to the airport and flight from Puerto Iguazú to Buenos Aires. Upon arrival you will be met at the airport by one of our Argentina For Less representatives and taken to your confirmed Buenos Aires hotel. You will have the remainder of the day to spend at your leisure, resting at your hotel or exploring Buenos Aires on your own. Read our Buenos Aires Travel Guide for dining and sightseeing suggestions. Enjoy an exciting half-day Buenos Aires tour of the city’s highlights. You will start your tour in the city center, on the beautiful Plaza de Mayo surrounded by the Casa Rosada (Government House), the Metropolitan Cathedral, and the splendid Cabildo, which served as City Hall under the Spanish colonial rule. You will then continue on to Puerto Madero, Buenos Aires’ modern, financial district, where you’ll learn about the fascinating transformation of this lively neighborhood. Your next stop is La Boca where the Bombanera soccer stadium and the large population of Italian descent showcase Argentina’s passion for soccer. In the San Telmo neighborhood, the heart of tango, you will learn about the history of this beautiful, sensual dance that has become the symbol of Argentinean culture. Finally, you will visit Palermo and Recoleta, the city’s upscale neighborhoods where the Porteños (inhabitants of Buenos Aires) come to indulge in high class shopping and gourmet cuisine. You’ll end your tour of Buenos Aires discovering tango at one of the most exclusive Buenos Aires tango houses, Tango Porteño. Enjoy a delicious gourmet dinner while musicians and professional tango dancers perform before you. Tango shows in Buenos Aires can be compared to broadway shows, with a live orchestra accompanied by professional tango dancers. Meet your transfer to the airport for your flight home or on to your next destination. Alternatively, extend your experience in this lively city with one of our other exciting Buenos Aires tours, or browse our full range of Argentina travel destinations for additional Argentina vacation ideas. One of the premier Copacabana Hotels in Rio de Janeiro, the excellent JW Marriott Rio exquisitely captures the enrapturing spirit of Rio de Janeiro. Guests will truly feel on top of the world as they soak up Rio’s magic from the hotel’s rooftop terrace and enjoy breathtaking views of the Sugarloaf Mountain and Corcovado from the swimming pool. Copacabana’s newest 5-star hotel, the JW Marriott Rio does not fall short of attractions with a Spa & Fitness Center, Mediterranean and Japanese gourmet restaurants, and a fully equipped business center. All 245 rooms are equally luxurious, elegantly furnished and featuring the latest modern amenities, including wireless internet, phone, work desk, 24h room service, newspaper delivery, and much more. Awarded by the World Travel Awards as “Brazil’s Leading Hotel” in 2009, and voted as one of the “World’s Best Places to Stay” by the Conde Nast Traveler, the JW Marriott just has everything to offer for your utmost comfort and to make your stay in Rio an unforgettable experience. A member of the Windsor chain, the very pleasant Excelsior sits on a wide corner offering excellent ocean views. Rooms either have a side view (superior) or a full ocean view (frentemar). All are elegantly furnished, spotless, and very well maintained. The best rooms are the deluxe suites that take up the entire corner and offer both side and full ocean views (luxo frentemar). The suites also come with spacious bathrooms, Jacuzzi tub, flat screen TV and a king-size bed. The hotel also throws in free local calls, free parking and an excellent breakfast buffet. The rooftop swimming pool and terrace are also a great place to unwind after a long day of exploring Rio's many attractions. The Martinique is the newest budget option of the Windsor chain, offering excellent services at great value. Located just around the corner from the Miramar, the hotel is only half a block off the Avenida Atlântica, within walking distance from Rio's best shops, restaurants, and bars. The hotel comprises two buildings gutted and joined together, making for some mazelike hallways, and is brand new, offering top-notch and modern amenities. It also boasts a rooftop pool and sun deck. Ideally located minutes away from Iguazú Falls and downtown Iguazú, Loi Suites is surrounded by the characteristic lush vegetation and wildlife of this tropical region. Indulge in a luxury stay at this excellent 5-star hotel where attention to detail and personalized service are the rule. With more than 160 luxurious rooms available, all fully-furnished with a minibar, wireless Internet access, and a security deposit box, no expense is spared to make your stay as comfortable as possible. After a long day of visiting the falls or the jungles of Puerto Iguazú, guests are invited to use the 800 square meter swimming pool, the recreation lounge or have a delectable dinner at one of the hotel's two exquisite restaurants. Combine relaxation and nature with a stay at the Aldea de la Selva hotel for an unforgettable Argentina vacation. Nestled in the green Paraná rainforest, this lovely hotel was entirely built with local materials. All comfortable rooms are spacious and include a private balcony with a hammock overlooking the rainforest. They are also fully equipped with modern amenities such as a mini-bar, cable TV, air conditioning, and safety box. Aldea de la Selva features a delicious restaurant, El Nido, accessible by footbridge, as well as three swimming pools and two Jacuzzis. Guests will also find customized environmental activities at their disposal, such as bird watching, zip-lining, and guided tours in the rainforest. Located in the heart of Puerto Iguazú, a few blocks from Avenida Costanera, Jardin de Puerto Iguazú offers guests a great range of excellent services. Featuring 30 comfortable and fully equipped rooms, some dotted with views of the garden and swimming pool, Jardin de Iguazú strives to make guests feel at home. This beautiful hotel is complete with free wireless internet, bar service, and swimming pool where guests can enjoy relaxing hydro-massages. The hotel's central location makes for a short walk to shops and restaurants, and the city's main attractions to enhance your Iguazú travel adventure. The Hotel Emperador is similar to its sister institution, the Hotel Emperador Madrid. Located in the center of Buenos Aires, it offers a personalized service to maximize your comfort. Its rooms are modern in design, but feature classic details such as fine, exotic, crafted furniture. It offers cars with drivers, concierge service, 24 hour room service, 24 hour medical emergency service, laundry service, fully stocked business center, free indoor pool, fitness center, sauna, solarium and massage center, and a restaurant and bar. Located in the exotic Palermo Soho district, Aspen Square is the perfect Buenos Aires hotel for those looking to escape the bustling city center. This modern 4-star hotel features minimalist design and blends perfectly with the diversity found in the Palermo Soho neighborhood. Aspen Square features 83 spacious rooms all of which feature simple yet innovative design. With a variety of options from a studio, one or two bedroom suite, Aspen Square is perfect for any traveler. All rooms come equipped with a LCD TV, air conditioning, and safe-box, while other options such as a balcony, kitchenette, or Jacuzzi tub are available. All guests can enjoy the exclusive breakfast lounge, the library, or the outdoor terrace, just a few of the fabulous amenities available at Aspen Square Hotel. TWO Hotel, a recently-inaugurated Buenos Aires hotel, offers a full range of services and amenities to please travelers looking for a comfortable stay in reasonably-priced accommodations. Guests receive complimentary wireless Internet access throughout the hotel as well as a continental breakfast. Rooms are fully appointed with LCD cable TV, work desk, mini bar, and safe box. TWO’s excellent location places it in the very center of the city, within walking distance of the historic center, theaters, dining, and more, perfect for travelers wishing to experience the bustling energy of Buenos Aires. Enhanced by new facilities and the attention of a highly trained staff, your stay at TWO is sure to be a memorable of your Argentina vacation. Hop country lines to see the Iguazú Falls from the Brazilian side, which boasts terrific panoramic views of the falls. Once you reach the entrance, you will board a comfortable panoramic bus that will take you into the park. Besides admiring the vistas, you can explore the Parque Nacional Foz do Iguaçu, an extensive reserve that includes wildlife trails. Visitors can also visit the Parque das Aves, an excellent aviary, as well as the hydroelectric Itapúa Dam. The border crossing is done along the Ponte Tancredo Neves and takes about two hours. Please remember that this trip requires a Brazilian visa. Tours are available daily at 8:30 a.m. and at 1:30 p.m. Note: The Brazilian Falls tour can be combined with the hydroelectric Itapúa Dam tour for a full day excursion. The Itapúa Dam was one of the biggest building sites in the world. Since 1975, the dam has been a model of green energy, providing most of the power to the nation of Paraguay. On the tour, you will learn about the dam’s construction. The dam is open to visitors every day except Sundays and on Brazilian public holidays. Note: This tour can be combined with a trip to the Brazilian side of Iguazú Falls to make it a full day trip. San Ignacio was built by early European missionaries that came to Latin America to spread the word of Christianity. These impressive ruins are some of the oldest examples of colonial architecture in the region. On this tour, you will also visit the Wanda Stone Mines located 25 miles (40 km) from Puerto Iguazú. The mines produce stones such as topaz, amethyst, rock crystal, and agate, among others. You will be able to admire the stones in both their raw form and after they have been polished and carved into beautiful shapes. Tours are available every Monday, Wednesday, and Saturday. They begin at 7:30 a.m. and end at 6:30 p.m.
On this adventurous tour inside the Iguazu National Park, you will board an all terrain vehicle that will take you down the rugged Yacaratia jungle path to the docks at the river, Puerto Macuco. From the open back truck you can spot parakeets, parrots, macaws, toucans, and many other birds. After exploring these lush forests you will arrive at the docks where you will board a river boat that will take you extraordinarily close to the breathtaking Iguazú Falls before arriving at another dock further upstream. The boat tour includes a 1.2 mile (2 kilometer) stretch of rapids. From here, you’ll continue on through the majestic Devil’s Throat canyon and disembark on San Martin Island. You will then return to the entrance of the park to meet your transfer back to your hotel in Iguazu. This tour is not recommended for pregnant women or those who suffer from a heart condition. On this tour, you will take a short 15-minute boat cruise around the Iguazú Falls area, which will bring you near the Devil´s Throat and other important and impressive falls. This spectacular tour takes you so close to the falls that you will be able to taste the mist before returning to shore. Please be prepared to walk down a number of stairs to reach the embarkation point. On this tour you will ride in an electric jeep to explore the jungle area around the falls. You will visit the roaring Macuco waterfall and then go by boat up the canyon to see the majestic falls. Tour days vary, so please enquire with your travel advisor. This tour teaches visitors about what jungle life was like for early inhabitants of the area. Beginning at 7:45 a.m., you will ride in a jeep through fields of citrus and banana trees. You’ll follow a private trail to the falls and learn about the real story of Tarzan, indigenous clay modeling techniques, and about the liana vine. You will arrive at the spectacular falls and have time to take in the sight before heading to the visitors’ center. You’ll have free time to explore the surrounding trails before meeting your transfer back to the hotel at 6:00 p.m. The Parque de las Aves (Bird Park) is located near the entrance of the Nacional Iguassu Park in Brazil, and consists of 12 acres of subtropical forest. During this excursion you will be taken on a guided nature tour through the park, where you’ll be able to catch a glimpse of hundreds of different types of birds in their natural habitat. This is a family-friendly tour great for all fitness levels. Just north of the Argentine capital lies the tranquil town of Tigre nestled on the banks of the Tigre River Delta. The summer home for Buenos Aires’s porteño elite in the 19th century, Tigre still retains its posh flair. You will take a tour from the heart of Buenos Aires to the northern outskirts of the city, and then follow the Tigre River to the delta. The town of Tigre sits here among tranquil waters and graceful canals. On this tour, you will visit the Rio Plate stadium, the Presidential Residence Olivos, and the San Isidro Cathedral. You will also take a boat cruise during which you will be able to catch a glimpse of the impressive mansions and estates along the delta. During the tour you will also stop for lunch (included). The tour starts at 9:00 a.m. and normally lasts around 6 hours. Buenos Aires is an interesting blend of European and Latin cultures and boasts a proud colonial and local cultural history.On this tour you will gain an in-depth understanding of the history, architecture, culture, and secrets of Buenos Aires.The tour lasts three hours and will take you through the city center and the neighborhoods of Montserrat, San Telmo, La Boca, Palermo, Bosques de Palermo, and finally Recoleta, home to the cemetery and grave of Evita Peron. This tour leaves daily at 2:00 p.m. from October 1st to May 31st. Buenos Aires is home to the largest Jewish population in Latin America, with approximately a quarter million Jewish citizens in its metropolitan area. During the early and mid 20th century, many Russian and European Jewish immigrants made their way to Buenos Aires, since Argentina’s immigration policy was one of the most accepting at the time. The Buenos Aires Jewish community retains many of the cultural traditions of their people. During your tour, a knowledgeable guide will take you to an Ashkenazi or Sephardic synagogue, where you can appreciate the remarkable architecture. You will also see the Jewish neighborhood, one of the hubs of Jewish culture.You will also visit the IFT Theatre, founded in 1932 as a Yiddish theater but now a secular one, the newly-restored AMIA building, center of Jewish headquarters, and the Israeli Embassy Square, where the embassy used to stand prior to the 1992 bombing. Tours lasts three hours and leave every morning Monday through Friday. Note: For security reasons, it is necessary that we get passport numbers of each visitor in advance in order to book this tour. On this biking tour you will explore the urban north of the city, which is the traditional home of the aristocracy of Argentina. The tour will start from the Retiro area and lead you through Barrio Parque, the embassies of Palermo Woods, past trendy Palermo Soho, and finish in Recoleta. The historical but tiny town of Colonia del Sacramento, in Uruguay is only an hour ferry ride across the Rio de la Plata from Buenos Aires. Visiting this picturesque town, now an UNESCO World Heritage Site, offers you a chance to step into the 17th century as it has preserved most of the old buildings in its historic downtown. The charming cobblestone streets are now a chic hangout for wealthy porteños and make an ideal day trip for those wanting a break from the bustle of Buenos Aires. In addition to experiencing an expert guided tour of various historic locations in Colonia, you will also enjoy lunch at a local restaurant (included). This full-day experience lasts approximately 10 hours, and you will be picked up from your Buenos Aires hotel around 7 am. Explore Buenos Aires by boat, sailing down numerous nearby rivers and streams. After breakfast at your hotel, you will be picked up and taken to the San Francisco marina. On the way, you will drive through the northern part of the city, past the United Nations Square, and take the Paseo de la Costa route past the Rio del Plata and the presidential residence in Olivos. Upon arrival at the Tigre mainland, you will have the opportunity to stop and look around the bustling Puerto de frutos, a busy market where you will find an array of wood and bamboo products for sale. You will reach the San Francisco marina and board the boat. Enjoy the beautiful views as well as complimentary drinks and picada (cold meat and cheese platter) on board as you sail down the rivers, canals, and streams of the delta. Learn about the history of Buenos Aires and its vibrant people, the porteños, on a tour to four of Buenos Aires’ highlights with a knowledgeable scholar as a guide.A university professor will first take you to and tell you about the Plaza de Mayo, the site where Buenos Aires was founded and that remains the historical and political heart of the city. You will then head out to Parque Lezama and the neighborhood of La Boca. One of the oldest districts of Buenos Aires, and a former settlement for Italian immigrants, La Boca is filled with artist workshops and colorful houses. Your next stop is Plaza San Martin and the Retiro district, which are modeled after European districts. The fourth and final destination on your tour will be the Recoleta neighborhood, known as the upscale and stylish district of Buenos Aires. This half day tour will get you acquainted with Buenos Aires’ vibrant cultural life, taking you to some of the city’s best art galleries, museums, and colorful street fairs. In the afternoon, your guide will pick you up and you will head to San Telmo to visit Marcelo Toledo’s silver workshop. This young artisan is internationally acknowledged for his intricate and exquisite work. You will continue on to the Fernandez Blanco Museum, housed in a splendid colonial house. Here you will be able to admire stunning collections of eighteenth and nineteenth century silverware pieces. Your last destination is the Malba Museum, the first twenty-first century art museum in Buenos Aires. You have the option to organize a visit of the beautiful, private Helft Collection, comprising interesting Argentine paintings from the 1960s to early 1990s, displayed in a building in San Telmo. The Arts & Crafts Tour operates daily except Mondays and Tuesdays, when the Fernandez Blanco Museum is closed. Discover the enchanting Gaucho culture and attend a typical “fiesta” at one of the many estancias that surround Buenos Aires. You will meet your guide at your hotel and travel approximately 1h to Estancia Susana where you will spend the day. By the end of the last century, Mr. Francisco Kelly, of Irish ancestry, named these 1,200-hectare lands “Santa Susana”, to pay homage to his wife, Susana Caffrey. The estancia is located in the district of Campana, close to “Los Cardales” town, in the province of Buenos Aires. During this tour, you will enjoy a guided visit of the the Spanish-colonial style “casco”, which holds an authentic museum of that period. Later on, you’ll experience the charm of the Argentine countryside, its wild scenery and aromas, with a sulky or horse ride. You will be served a typical barbecue lunch comprising a variety of meats, salads, and vegetable, while enjoying a folklore show, with music and dances. The day will end with some typical regional games such as the “carrera de sortijas”, where two teams gallop at full tilt under a wooden arch and try to pass a pin through a small ring hanging from the arch. Begin your tour with a stroll along the most beautiful beaches of Rio de Janeiro before heading for dinner and a traditional Brazilian samba show. You’ll experience the rhythm that pulses through the veins of Brazilians. Samba, like the country where it originated, has its roots in African and European rhythms. The music and dance are now synonymous with Brazil’s world famous Carnival celebrations. You will start this half-day tour with a drive through the beautiful city of Rio during which you’ll be able to spot the Sambadrome, where the Carnival parades take place, and the Metropolitan Cathedral. You will also see the Cinelandia Square surrounded by interesting historic buildings, including the Municipal Theater, National Library and National Museum of Fine Arts. You will continue on to the Sugar Loaf Mountain, one of the symbols of the city, located in the Urca neighborhood. You will ride the cable car up to 705 feet (215 meters) to a viewpoint from where you can see the entire Guanabara Bay, the Rio Niteroi Bridge and Corcovado Hill, on top of which stands the famous statue of Christ the Redeemer. From there, you ride a second cable car up to 1,295 feet (395 meters). From here, you’ll enjoy fantastic views of Copacabana beach, the Santa Cruz fortress and the entire city below you. 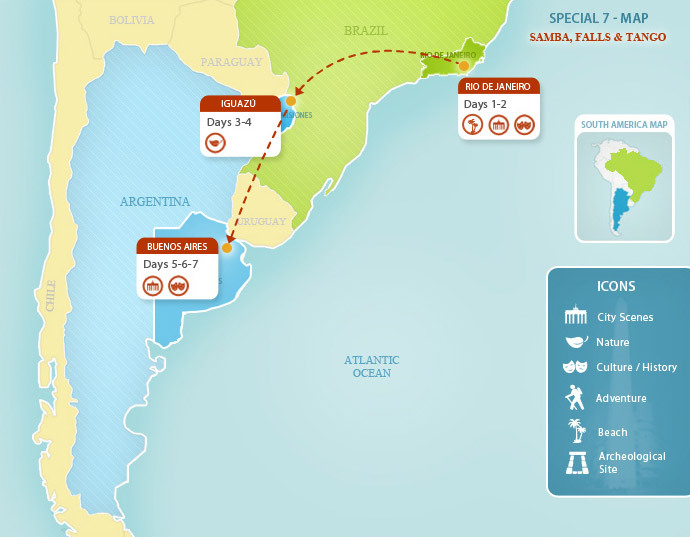 Take a fascinating journey to Petropolis, located 37 miles (60 km) away from Rio. Known as the Imperial City, Petropolis was founded by Germans and its rich history is still reflected today in its lovely architecture and charming streets. You tour will begin with a visit to the Imperial Museum, the former Palace of Emperor Dom Pedro II. The museum displays antique furniture, pearls, diamonds, and a crown of gold used by Pedro I and Pedro II. After this visit, you will continue to the Gothic Cathedral, also known as Sao Pedro de Alcantara, built in honor of the Emperor of Brazil. Here you will see the tombs of the Imperial family, where Princess Isabel was buried along with Pedro II and his wife. From here, you will tour the Crystal Palace, originally built in Saint-Saveur-les-Arras, France in 1879 and later re-constructed in Brazil. Rio’s tropical islands are some of the most beautiful places to visit near the city. You’ll drive for approximately one hour and 30 minutes through numerous lush fields, banana plantations, and villages along the way to the small fishing village of Itacurussa. There, you will embark on a saveiro (typical schooner from the northeast of Brazil) for a leisure cruise in the calm waters of the Sepetiba Bay. You can stop for swim on a deserted island, before continuing on to a private island where you’ll enjoy a tantalizing buffet luncheon served in a tranquil and rustic atmosphere. After the meal, you are free to explore the island's charms on your own by strolling along the beach, swimming, or just working on your tan. Special features can be arranged to enhance the day even more, including treasure hunts, snorkeling, water skiing, and more. In the afternoon, you’ll take the boat back to Itacurussa and be transferred to your Rio hotel. This unique tour of one of the famed favelas in Rio de Janeiro offers travelers a glimpse into a side of Rio that visitors rarely get to experience. Santa Marta is one of the first communities in a program designed to welcome tourists to the favelas; poor but culturally vibrant neighborhoods where a strong sense of community has inspired a long tradition of music and art. Santa Marta is located on Dona Marta Hill, officially part of Botafogo, in Rio de Janeiro. The residents refer to the district as Santa Marta because of the image of the saint which has adorned the inside of the chapel at the top of the hill since the beginning of the twentieth century. Believe it or not, you may have already had a quick view of this neighborhood if you saw Michael Jackson’s music video for They Don’t Care About Us, meant to draw international attention to the residents of these communities. There are plans to build a statue of the famous pop star in one of the places he used for filming, Beco do Curió, beside the church of Assembly of God on the terrace of the district’s Culture House. On this three hour tour, you will be picked up from your hotel by jeep, and driven to the neighborhood. From here you will stop at the elevator turret and see the place where Michael Jackson filmed, before walking through the streets to the residents’ association. On your way back to your hotel, the driver will take a picturesque route near the Lagoon.